What are the Best Rolling Backpacks for Girls? Backpacks have been in use for many years and have seen lots of changes over this time. Other item carrying bags have been repurposed to suit the style of the backpack and have seen greater integration as more and more people are becoming mobile and have many uses for their purchases. One such thing is the backpack, which formerly was just for carrying books to and from school. These days the humble backpack can take on multiple roles including the briefcase, suitcase, storage device, laptop bag and many other uses. Following on with the statement that the backpack has taken over the suitcase, more and more backpacks have incorporated wheels to accomplish this. In the push to provide better support for people’s backs, wheel added backpacks are easier to pull around and can also be used as a replacement for travel luggage which is frequently large, heavy and not at all fun to carry on your back. This guide aims to devise the best method of choosing a rolling backpack, in particular for girls. This rolling backpack is the perfect size for both schooling and travelling because it comes with a wide compartment that can easily fit most of your belongings. It also comes with a number of pockets that you can use for easier organization. Made from 100% polyester, the fabric can be easily cleaned and hand washed in case of dirt, stains, and spills. It is 10” high and 14” wide, which is the right size for girls in grade school or high school. PROS: There are a variety of colors and designs to choose from; there are about 27 choices for both boys and girls. The latter will definitely love the pastel colors, ranging from pinks and purples to sky blues. The combination of patterns and wonderful colors make up for a very eye-catching piece. The prints vary; there are flowers, swirls, geometric patterns, etc. The interior is roomy enough for books, electronic gadgets (although there’s no provision for laptops and tablets), and pieces of clothing. The bag’s hardware is pretty solid, although it does give a cheap plastic feel, especially the bottom part near the pair of front stands. The handles are pretty standard; it can be adjusted to the desired height of the user, and can be tucked in securely when you decide to use it as a backpack. Thick padding protects the metal parts of the handle so nothing will protrude against your back when carried. The wheels are sturdy enough to take some beating and long walking. CONS: Maneuver the handle with care; don’t let it swing from side to side, especially if you’re carrying a lot of stuff because the plastic handles aren’t that durable, as many customers have complained. The handle bar is prone to having cracks, and overtime, it may snap off completely. Also don’t carry the bag through the handlebar, instead, use the built in handle atop of the bag. The zippers of the bag are pretty substandard as well so minimize pulling and tugging hard. This core series rolling backpack is the most expensive out of the bunch listed here. It is because of the high quality materials used to construct this product. You will know when you feel the thick fabric used, coated so it will repel low levels of liquid. The fabric is composed of 600D Poly and 420D Velocity. Pulling it behind you is also very easy and lightweight despite having so much inside the backpack because of the smooth-gliding wheels. The wheels are etched with tractions for stability control. This is perfect for pavements, rocky paths, and dirt paths. PROS: it comes with a single pole retractable handle that can be easily adjusted and locked depending on the desired height of the user. It has two large compartments to give you more room for your stuff and for ease in organization. This wheeled backpack is perfect for use for both school and travel as it can endure both heavy weight and long walks. There is a padded sleeve inside that fits a 15” laptop, and other electronic devices like tablets and phones. Other storage features are a large compartment in front that comes with an organizer for your smaller items such as keys, coins, pens, clips, etc. It also has a front zippered stash pocket for stuff you want to access quickly, a side mesh pocket for your water bottle. The shoulder straps can be tucked away when not in use and can be simply pulled out of cover. The straps are padded as well as the back for additional comfort. CONS: Many owners complained about the flimsy handle that breaks up only after a few months of use. Although this hasn’t happened to many of the customers (the majority of reviewers were satisfied with the overall quality of the product), for something that is over a hundred dollars, this JanSport bag should be doing better than expected. Also, there’s not much design for girls; it comes in three colors in Amazon: Black, Pink Pansy Preston Plaid, and Viking Red. This bag has a large main compartment, perfect for grade schoolers or high school students who lug a lot of books, binders, and folders. Travellers will also feel satisfied with this bag because of its sturdy materials; it can endure hours of being lugged behind as well as thrown into the plane storage. PROS: Aside from the roomy space inside the main compartment, there’s also a padded computer sleeve that holds laptops up to 17 inches. There’s also a large zippered front compartment that has several pockets and an organizer to better hold your smaller things such as keys, pens, clips, chargers, phone, etc. It also has a media pocket so you can listen onto your iPod on the go. The corner-mounted wheels are also smooth sailing; you can pull it behind you with ease no matter what the surface is. This wheeled backpack is comfortable to use whether lugged or lifted. The single-tube telescoping handles adjust accordingly and are tucked away inside a padded panel when not in use. The straps, meanwhile, are contoured according to the body’s natural shape. It is also padded and meshed, and is easily adjustable for the wearer’s comfort. CONS: This bag is heavy even when empty at five pounds. If you’re going to put a lot into it, don’t expect that you’ll be able to carry it for long, especially if you have to go up a flight of stairs. The weight is not a problem when you’re going to simply roll the backpack, but if you’re going to carry it, you might have a difficult time. Owners don’t recommend it for students in grade school with small frames, especially girls. SUPERIOR QUALITY - Premium fabric makes Wildkin's Rolling Luggage water resistant, durable, sturdy, and long-lasting. This rolling luggage will travel anywhere and everywhere with your little one and will do so for many trips to come. TRAVEL-FRIENDLY DESIGN - Each Rolling Luggage features a telescopic top handle making travel easy and fun for your child, but it's the spacious main compartment that will make packing a breeze for parents. Features include a zippered front pocket for quick and easy access to your most used items, as well as a convenient mesh divider and water bottle pocket to help you stay organized on the go. DUAL PURPOSE - Each Rolling Luggage measures 16 x 12 x 6 inches. You'll find this bag super roomy and suitable for all types of trips, not to mention being a perfect school accessory for the student in your life. You'll have no trouble finding room for everything your child needs no matter the occasion. From a long weekend in an adventurous destination to your daily stroll to school and back, your little one won't want to leave home without their Rolling Luggage by their side. This is a great choice for girls because the pink color and the prints are really cute. It also functions well, having lots of exterior pockets that help in better organization and a large main interior where books, folders, and binders can fit easily. Although it doesn’t have a padded pocket for your laptop and other electronic devices, it can also fit in quite easily. PROS: This rolling backpack is made of 100% polyester with 600-denier fabric. Because of the tight knit of the fabric, you’re sure that it won’t easily rip. The seams are also well stitched, especially around the zippers where most of the force is stressed. There are two large pockets in front that can be used to store electronic devices and other small supplies such as pens, papers, clips, etc. The pockets are also padded so it can double as a lunchbox, so you don’t have to bring an extra bag. There is a side mesh pocket for your water bottle on one side, and one zippered pocket on the other side for items that you want to access easily. The bottom is made of sturdy rubber to effectively hold all the weight. The straps are not hidden, but they don’t interfere while rolling the backpack. It is padded to ensure comfort while worn. CONS: Customers complained about the handle of the backpack because it is prone to being pulled right out of the bag. If this happens, the bag is pretty much useless. Cases like this is very few so it must have been because of poor quality control. Good thing, the company is very eager to give customer assistance and is quick at replacing broken bags. This rolling backpack is made of 100% polyester material that is 10” high and 13” wide. It is great for lugging books, notebooks, and folders for school but not so much for travelling, as it doesn’t feel sturdy enough for long-haul plane travels. PROS: The bag is very roomy for all the stuff you’ll need for school. Packed lunch, extra set of clothing, and other essentials can fit in along with your school needs. There’s also a built-in laptop compartment that can house up to 15-inch screen size. There’s a front pocket to house all smaller items, for easier organization. It comes with a single aluminum handle and padded straps for carrying. CONS: The zippers and the cloth itself aren’t made from the best materials out there as it showed signs of tear and wear only after a few months of use, as reported by unsatisfied customers. Although the zippers can still be fixed, it’s quite a hassle as you’re paying about $50 for a substandard quality. Also, if anything breaks (such as the handle, which is the most important part of the bag), you can’t have it replaced or repaired, as the company doesn’t offer warranty. How to select the right rolling backpack? Intended Use: Wheeled backpacks are useful for many reasons, but they help to achieve many purposes as well. Why would you need wheels on a backpack, you ask? That is to prevent you from having to carry it on your back. Despite the name, these should in most be used only on wheels. Rolling backpacks are usually quite large and their intended purpose is for use as luggage carriers. This means that you’ll be filling it up with lots of clothes and other items that will be cumbersome and heavy as well. Unless of course you use them in everyday life, these backpacks will most likely not be used for occasions such as going to school or to and from work. The use of rolled backpacks does not change between men and women, so you won’t have any trouble finding rolling backpacks for girls, unless of course you are looking for a particular style, design or sometimes color. Design: As mentioned previously, when choosing the best rolling backpack for girls, you will want to consider the design. 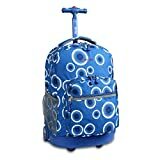 Will the overall design of the rolling backpack be a major issue when purchasing for the intended person? Most of the designs you will find at stores which sell rolling backpacks or even travel stores will mainly be simple color designs, usually with a base color (E.g., Blue, Red, Green, etc.) and a primer color that is much darker or contrasting (E.g., Grey, Black, or white if the backpack is black). Whilst you can also find more feminine colors such as pink and purple, you’re more likely to find the base color mentioned previously. Despite this, it is still quite possible to purchase designs as well and even find special brand designs, although for the most part there are more base colors than stylized. Durability: When picking the best rolling backpack for girls you might initially forget about durability over the style and design choices, but it plays just as important role as any. Durability in rolling backpacks is the most important feature of choosing which should never be forgotten. A highly durable rolling backpack helps to accomplish the main intended purpose which is use in multiple environments where it can be affected by adverse stress such as stretching from being overloaded, being thrown about in luggage compartments and being carried and pulled around many times. Thinking exclusively of rolling backpacks purchased for travelling purchases, you will want a backpack that can last you at least 5 years. Having a backpack that can reach this age under the constraints of travel is important, as you do not want a backpack that is full of your belongings which cannot maintain it whilst you’re in a foreign country and your belongings are all in one place. Comfort: If you can see yourself also carrying around this backpack on your back aside from carting it around on wheels then you will want to ensure that it is comfortable. One feature you should be aware if is any sort of metal frame inside the rolling backpack. Some forms of rolling backpacks actually have metal frames near the back, helping it to keep its shape and prevent it from collapsing on itself. Whilst this is helpful in creating more space and stopping items from getting squashed, it can be very uncomfortable particularly when worn on our back. Comfort in a backpack resides in padding, particularly in the back and the straps. Los of padding will be needed around the lower back and also on the shoulder straps, as these parts of your body will bear the most weight. Additionally, the layout of the backpack can determine where the weight will shift onto your body where worn. Backpacks that slump more when full of items will tend to add more pressure to your lower back and cause you to lean forward, which can cause much pain over prolonged periods of time and even in the short term. Compartments: Compartmentalization should be considered if you intended to take items in and out of your backpack or if you just want more pockets in general. Having smaller pockets on the outside can help with putting less important items in your rolling backpack that can be easily accessed at a moment’s notice. This goes without saying; they should not be used to put important items such as travel documents or important certificates. More pockets should allow for more places to store items but it should be noted that the more pockets are available on the outside; you’ll most likely have less overall space in the internal body of the backpack. Wheels: It might seem a bit absurd to mention wheels, but depending on how often you use the mobility function of a rolling backpack it can be an important factor. The wheels will take the brunt of the weight when you’re pulling around a rolling backpack, with some having better quality wheels than others. When looking into the wheels, try to investigate the material they are made out of. Simple plastics that don’t look too diverse will not be able to withstand much pressure nor will they have been installed to a degree where they can handle much abuse. Higher quality wheels will tend to look like a plastic rubber, and usually have both sides covered like how a motorcycle wheel has connections on both sides, rather than have one side exposed in a similar fashion to a car wheel. The rubber plastic material of wheel will also produce a smoother ride, as it has greater absorption and also will create less noise when being pulled or pushed across gravelly or uneven road. 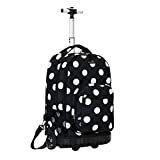 Handle: The handle is a much smaller issue when selecting the best rolling backpack for girls, although you may have a preference over the other. Some backs will offer handles with only one poll and “T” handle similar to that of a walking stick or cane, whilst others will have two extending poles that have a bridge handle connecting them together. It is up to you to determine which ones is best. Comparatively both offer the same function and do not necessarily have any benefit over the other; it is simply a matter of personal opinion. If you’re not comfortable with the ‘T” handle spreading your fingers apart when holding onto the handle and you much prefer to have a solid hand grip around the handle then the bridging handle would be a better choice. Size: Having a small or large rolling backpack is not an issue, although it should be determined by you intended use as previously mentioned. You can get quite large rolling backpacks that can hold a number of clothes and other items, making it perfect for long overseas travel. Alternatively if you’re perhaps only taking a day trip somewhere, you can get smaller rolling backpacks that will be able to fit a modest amount of items but be less cumbersome to carry around and still easy to pull whilst it is on its wheels. Price: Most rolling backpacks will set you back around $40 average, although you can find ones ranging from as low as $20 all the way up to $150. When deciding on one based on price, you’re much better off purchasing a rolling backpack that is close to the average or higher. When it comes to purchasing any items that relate to baggage or luggage, you want the best quality you can get and price should not be the defining factor. As was mentioned previously, these bags will need to be strong, tough and durable, especially in situations where you will be carrying them along with you. You do not want to be stuck in a foreign location with a large, full bag that is broken. 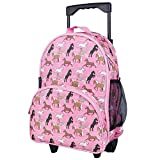 Selecting the best rolling backpack for girls should not be any different for any other gender or age group, as usability is a key feature and in most cases this is directly related to the price that you pay.